Your liver depends on you to take care of it... so it can take care of you. It serves as your body's engine, pantry, refinery, food processor, garbage disposal, and "guardian angel." The trouble is, your liver is a silent partner; when something's wrong it does not complain until the damage is far advanced. 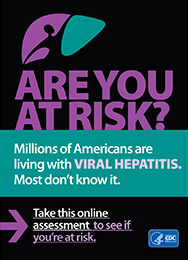 So it needs your help every day to keep it healthy and hepatitis-free. To do that, you need to eat a healthy diet, exercise, get lots of fresh air, and avoid drugs, alcohol and environmental polutants that can cause liver damage. Sadly, people generally have little knowledge of the complexities and importance of the thousands of vital functions their livers perform 24 hours a day. The liver is about the size of a football – the largest solid organ in your body. The liver plays a vital role in regulating life processes. Before you were born, it served as the main organ of blood formation. Now, its primary functions are to refine and detoxify everything you eat, breathe, and absorb through your skin. Quite simply, your liver is your body's internal chemical power plant, converting nutrients in the food you eat into muscles, energy, hormones, clotting factors and immune factors. It stores certain vitamins, minerals (including iron) and sugars, regulates fat stores, and controls the production and excretion of cholesterol. The bile, produced by liver cells, helps you to digest your food and absorb important nutrients. Your liver neutralizes and destroys poisonous substances and metabolizes alcohol. It helps you resist infection and removes bacteria from the blood stream, helping you to stay healthy. Arguably, your liver isn't just your silent partner – it's your best friend. Monitor the state of your liver at least once a year to determine if the disease is progressing and if cirrhosis or liver cancer is developing. Review all medications with your physician. Some over-the-counter and alternative medicines can harm the liver. Have periodic ultrasound and alpha-fetoprotein blood tests for liver cancer. If pregnant, be sure to tell your physician you are a hepatitis B carrier so your baby will receive hepatitis B vaccine and immune globulin at birth. On routine visits, remind your doctor, dentist, and other healthcare providers that you are a hepatitis carrier. Stay informed about research developments regarding treatments so you are able to make the best decisions. Research is ongoing to improve the treatment for chronic hepatitis C (HCV) and hepatitis B (HBV) infections and develop a vaccine for HCV.